Plastic pollution is attracting significant public attention. Last week prime minister Theresa May made a pledge to eradicate all ‘avoidable’ plastic waste by 2042 the centrepiece of her government’s plan for the environment. Meanwhile at New Design we reported on the CamCup, an ecologically sound alternative to plastic-lined throwaway coffee cups that is being developed with support from Design Council. Many design students are hoping to contribute to the battle against plastic waste and Laura-Monica Carusato, 19, a first year product design student at the University of East London (UEL) has been announced as the winner of a competition that challenged UEL students to develop concepts to help reduce pollution on Britain’s beaches. Her beach bin, the form of which is inspired by ventilation tubes on large ships, won the contest sponsored by environmental charity GreenSeas Trust. Laura’s bin was selected over the creations of ten other UEL Product Design students. 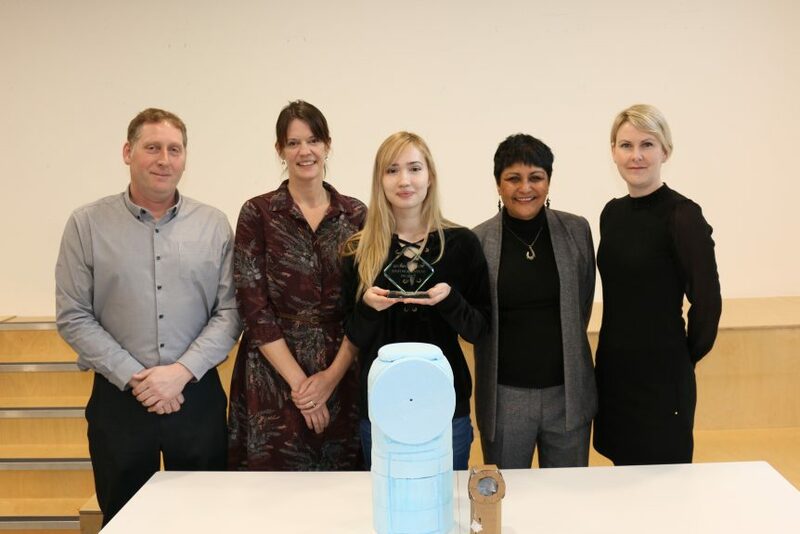 On Wednesday, the students presented their final prototypes to a panel of judges which included Karen Sherwood, a development and team project manager with Biffa, an integrated waste management company in the UK. “I picked this design as it’s nautical, so it fits well on a beach. And it’s bright so it can’t be missed. It’s designed so people don’t just place or drop plastic waste in the bin, they throw it in, so it becomes fun, something children and adults can enjoy, like playing basketball,” commented Carusato. “Laura’s prototype won for its originality of design, ease of use, and because it would be practical to clean and empty,” added Sherwood.